Andrew Cooper and Alex Schulze's company has cleaned over two million pounds of plastics from coastlines around the world. Andrew Cooper and Alex Schulze, two millenials and keen surfers, celebrated their graduation from Florida Atlantic University business school with a holiday in Bali in 2015. They were horrified by the amount of plastic washing up on the beaches and decided to do something about it, putting their brand new business degrees to work. The result is 4ocean, a cleanup company that, in less than two years, has cleaned up over two million pounds of plastics from coastlines around the globe. 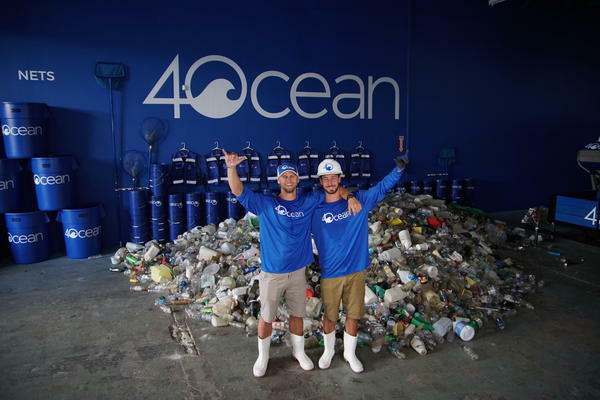 4ocean is positioning ocean plastic as an opportunity, employing locals and paying the at first disbelieving fisherman to collect plastic rather than only catching fish. “Unemployment rates are very high in these different areas. It’s something the fishermen then take pride in doing,” says Alex Schulze. Headquartered in Boca Raton, 4ocean is funded entirely from selling $20 bracelets made from recycled glass. For each bracelet sold, they promise to remove one pound of plastic. “When you look at a non-profit, or charity, we really didn’t want to go that route and ask with our hand out, rather create a product and a business solution so this can be around long after we are gone,” says Schulze. Their business model of operating solely from selling their bracelets has been a remarkable success. 4ocean now has a presence in 27 countries, with over 200 employees, and crews working in the ocean 7 days a week. Schulze and Cooper have over a million of followers on Instagram and another million on Facebook. The pair has been nominated for the 2019 edition of Forbes 30 under 30 in the Social Entrepreneur category. 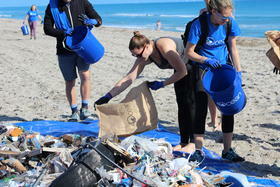 Around 9 million tons of plastic finds its way into the ocean every year, according to a report in the journal Science. Most of it arrives in the ocean via rivers. In fact, a study published by the Environmental Science & Technology journal estimates that just 10 river systems carry up to 90% of the plastic that makes its way to the ocean. “I think there’s a popular misconception that it is coming from ships just dumping offshore like a garbage truck. It is not dumped,” describes Andrew Cooper. Cooper and Schulze have designed their newest tool with these data in mind. Docked behind the Bahia Mar hotel in Fort Lauderdale is an oil rig supply vessel that has gone through a dramatic transformation. The bright blue 135-foot Ocean Plastic Recovery (OPR) Vessel is equipped with 4 ‘panga’ vessels, an open, outboard powered fishing boat,e ach 22-feet long, and an accompanying landing craft, which will place booms in river mouth areas and pick out the trash they intercept. A unique amphibious excavator will be able to enter marshy estuaries, minimizing damage by floating on pontoons and using its customized claw to grab embedded plastic. OPR Vessel's deck is capable of carrying 310,000 pounds of plastic, and transporting it to the nearest facility where it can be processed for recycling. “Our mission with the OPR campaign is to create an economy around the plastic,” said Schulze. They are thinking big - really big. “If we prove this business model, we can solve ocean plastic forever,” says Schultze. To skeptics, cleaning the entire ocean seems like an impossible feat, but not to Alex Schulze and Andrew Cooper.